Hello Pinkwhen readers! 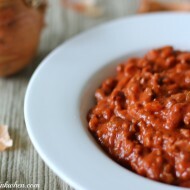 It’s Brandy from BD Design and it’s so good to be here on the blog today. 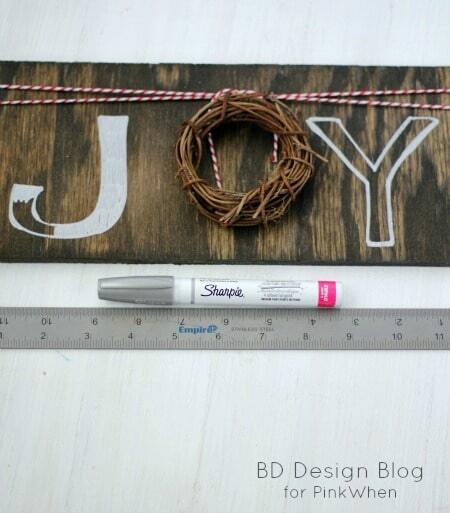 The holidays are approaching quickly so today I’m sharing a simple Christmas sign that you can make yourself. 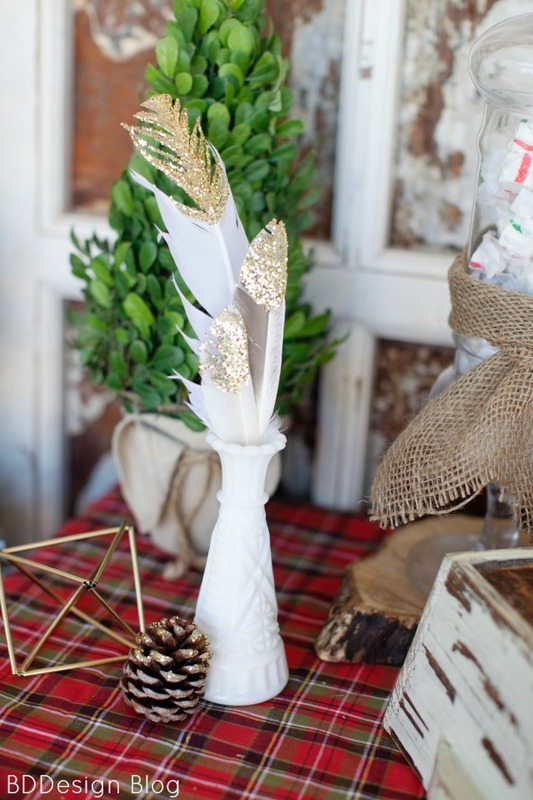 This year I am absolutely loving the rustic Christmas look that is on trend right now. This cute woodsy little sign is the perfect accent to any decorations you already have. Just adding a few rustic pieces can bring the warm and cozy feeling into any room. 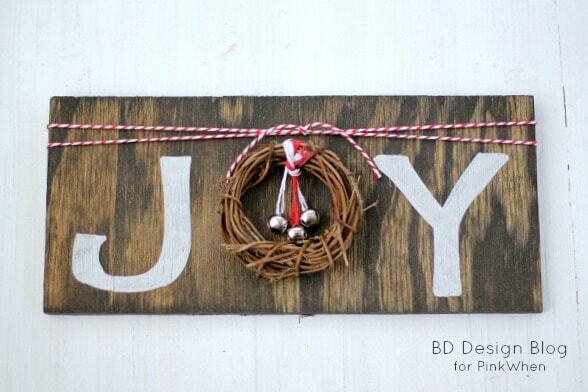 Let’s get started with this Rustic Joy Sign. Cut your board to 4″ x 11″ dimension. Sand the board with your sandpaper so that it’s smooth. Stain the board using a old rag or t-shirt. The Jacobean stain is a very dark stain and the longer you keep the stain on the wood the darker color you will have. So with this particular board, I applied the stain and then immediately wiped it off. Once the stain is dry, wrap your baker’s twine around the top a few times and then tie in the middle. I did this first so that it gave me a more precise idea of where to hammer in the nail and write the letters. 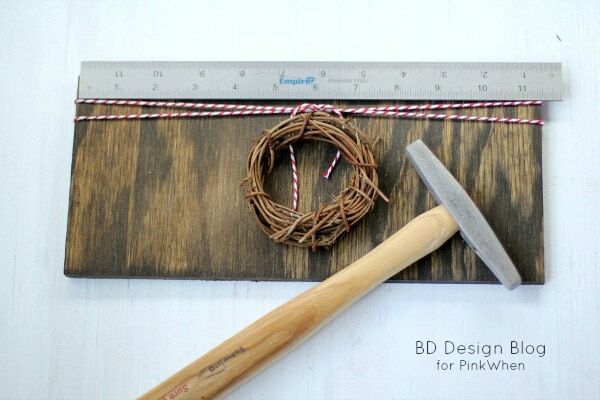 Then attach the little wreath with a tiny nail in the center of the board. Write the letters “J” and “Y” with the wreath being the “O”. If by chance you don’t like your handwriting or you want the letters to be perfect you can stencil these letters on. I personally like the personal touch of a hand written look but you can do whatever you would like. If you are wanting to hang this sign on the wall simply attach a saw tooth hanger to the center of the back of the sign. That’s it! Super simple but really cute. I hope you all have a wonderful holiday season this year! If you like this sign, you can check out my Etsy shop that is filled with unique hand painted signs that are great for your home or to give as gifts! Are you throwing a Christmas party this year? If so, check out this post on how to make a green leafy wreath. This Medallion Christmas Wreath is also a good one. This Joy Subway Sign was a HIT last year in my home. Check out this easy DIY craft! Great DIY project. We might do this kind of craft this weekend. 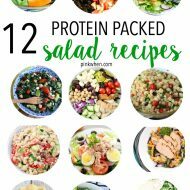 Thanks for sharing your idea/tips.